: 2003 promises to be a busy year for space collectors, with new and recurring auctions, book releases and other space history themed events scheduled to help expand our collections. To help you plan, we have published a preview for 2003.
: No sooner did we publish our 2003 preview (see previous update), than we heard of yet another event set for the coming year. The Space Unit's New York Chapter has scheduled their annual Postcard, Autograph and Stamp Show to be held in Ridgewood on April 12. The show will feature a cancellation in honor of the centennial of the Wright Brothers first powered flight. : Patricia Carey, 81 who in 1962 founded the planetarium that would eventually grow into the Kansas Cosmosphere and Space Center, died Jan 1. at a hospital in Kansas. Carey was honored by the museum last June within a 7-by-14 foot mural by Robert McCall showing her as a young woman by her telescope and then again elsewhere as she appeared more recently. : Fisher, Parker, and now, the Krone Apollo 11 pen. Featuring embedded flown Kapton tape, embossed footprints, and a letter autographed by Buzz Aldrin, the pen is offered in silver, gold or platinum. : Sing Tao Daily is reporting the identity of the first Chinese yuhangyuan (astronaut) as Mr. Chen Long. According to the paper, Long will fly solo on the first crewed flight of Shenzhou, expected later this year. Long, and a yet-to-be-named back-up, were selected from a class of 14 candidates in training. Pictures of Long have not yet been published. : By every indication, Franz Strambach admired Judith Resnik. His website at judith-resnik.info provides a list of resources dedicated to the Challenger mission specialist. With that in mind, it's hard to imagine what Strambach was thinking as he stole an aircraft at gunpoint and then threatened to crash into the European Central Bank in Frankfort, Germany — unless he could speak with the astronaut's brother. On the phone with a local news channel, Strambach declared "I want to make my great idol Judith Resnik famous with this." After he spoke with Charles Resnik (who refused to disclose what was said), Strambach landed and was promptly arrested. Can you see us now? Good. If you tried to visit cS on Monday and were unable, we apologize. Strong Santa Ana winds downed power lines and with them, our web server. If you sent us e-mail during the past 24 hours and do not hear a response today, please try sending again. : NASA's first nurse to the astronauts, Dee O'Hara is now signing photographs for sale through Farthest Reaches. In addition to solo portraits, O'Hara has also teamed with Wally Schirra to offer co-signed inscriptions that capture the astronaut's trademark 'Gotcha!' humor. : There's only one place in the United States where you can meet an astronaut every day of the year (except Christmas): the Kennedy Space Center Visitor Complex. As of today, there is only one place you can view the 2003 schedule for this Astronaut Encounter: collectSPACE Sightings. : When was the last time you viewed the complete, unedited footage from the Apollo 11 moon landing? Perhaps it was July 20, 1969? Now you can relive every minute remastered on DVD. Bill Hunt, editor of the online DVD news source The Digital Bits, reviews Spacecraft Films' Apollo 11, Apollo 14, and Apollo 15. Dan Vergano, writing in today's USA Today, questions the merits of space memorabilia collecting. Through a series of interviews with museum curators, space historians and NASA officials, Vergano suggests that the artifacts currently in private collections would be better served in public hands. The article cites the W Foundation as "a non-profit that encourages space collectors to lend items to science centers rather than hoard them for the resale market." We were unaware that such an organization existed, let alone was needed, as many collectors already share their collections online and with their communities. What do you think? 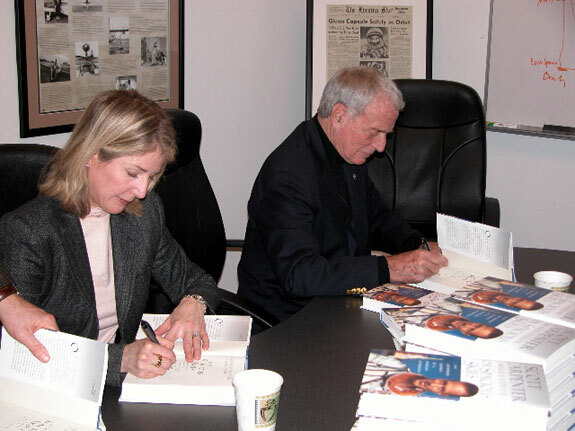 : Scott Carpenter, his wife Pat, and daughter/co-author Kris Stoever arrived at our office this afternoon to sign copies of Carpenter's new book For Spacious Skies: The Uncommon Journey of a Mercury Astronaut. For those with orders pending, your books will start shipping early next week. If you haven't yet bought your copy, you can still order via buySPACE. : After months of delays (STS-107 was originally scheduled for July), Columbia took to the skies today with a crew of seven, including Israel's first astronaut Ilan Ramon. Without any technical or weather issues to speak of, STS-107 began its 15-day research mission at 10:39 a.m. ET. In addition to a SPACEHAB double module and over 80 experiments, Space Shuttle Columbia carries nearly 8,000 mementos and souvenirs comprising the STS-107 Official Flight Kit. : In 2001, Superior Stamps & Collectibles' space department was wrapping up their final sale. Now under new ownership, Regency Superior Galleries is again offering space memorabilia, beginning with their auction this Sunday. Though it isn't entirely dedicated to space, their first sale includes 120 lots featuring astronauts' autographs and flown artifacts. : In November, NASA told the Astronaut Hall of Fame that "the Mercury 'Liberty Bell 7' spacesuit, boots, gloves and helmet worn by Virgil 'Gus' Grissom are the sole property of the U.S. Government" and that they should therefore not be released to anyone without written direction. Alas, the caveat came too late, at least in the case of Gus Grissom's flown helmet. As was reported in Sunday's Hoosier Times, Grissom's head gear that he wore on his July 1961 mission is on display in Spring Mill State Park, Indiana, apparently donated to the park his parents. : By day, Scott Phillips is a mild mannered logistics engineer working for Lockheed Martin on the external tank program. By night, weekend and any other free moment he might find, Scott is 'Shuttleman', able to transform exotic woods into space shuttle models worthy of astronaut attention. All levity aside, if you have not seen Scott's replica orbiters, you should have a look. : February 4 has been set as the new deadline for Apollo 15 command module pilot Al Worden's private signing. The gallery debut of Worden's photography-inspired art is still scheduled for January 31.
: Surfing through NASA's website for STS-107, we came across a crew photo that was clearly signed by autopen. As the best means to identify these mechanical autographs is to directly compare them with known patterns, we have begun an archive of examples, including the STS-113 crew as well as ISS Expedition 6.
: Ken Winans, founder of The W Foundation, replied to our recent entry which called into question the need for the organization whose reported purpose is to encourage space collectors to donate to museums (when many collectors already do so without encouragement). Winans' reply revealed that the effort was started to benefit a specific museum and that there are other benefits that collectors may consider. : Today is "Super Bowl Sunday" and if you have yet to select a favorite team, perhaps you can take the advice from your favorite astronaut. According to the Scripps Howard news service, one of the first men on the Moon, Buzz Aldrin predicts the Raiders will win 14-10, while one of the last, Gene Cernan is for Tampa Bay. Meanwhile aboard space shuttle Columbia, STS-107 pilot William McCool is siding with his home-state team Oakland, and David Brown has chosen the Buccaneers because his ride launched from Florida. Regardless your choice, be sure to catch the Sony astronaut ad in the fourth quarter. : With this year the centennial of flight, you can be sure that a full series of commemoratives and retrospectives are in preparation now. One of the first to be released, Flight: 100 Years of Aviation by the Smithsonian's National Air and Space Museum adopts a visual look at the people and planes that paved the way from the Wright Brothers to the space shuttle. Larry McGlynn offers his review of this review. : Starting in March, collectors can look forward to three monthly space auctions hosted by three different firms. First to bat is Regency Stamps (formerly Superior Galleries), that will include two lots with a space theme: Apollo 1 prime and back-up crew signed portraits (first brought to collectors' attention on collectSPACE). In April, Swann Galleries will host their first space-themed auction, though behind the scences, it is being organized by the same team who orchestrated the Christie's East sales. Finally, on the last day of May (and on the first of June), Aurora Galleries will hold their third biannual space auction with a selection of rocket mail and paraphernalia. : After hearing about Scott Carpenter's book signing being canceled in Seattle due to a death in the family, it has now been confirmed that all events scheduled for Colorado have also been postponed. Organizers have been told that every effort will be made to reschedule, but they do not know when. : Astro Auction will relaunch with bidding to start Saturday at noon (ET). The auction site owners Novaspace Galleries has said that improvements and new features will continue to be added in the weeks to come. Not coming however is astronaut James Lovell, who Novaspace had previously scheduled for a February autograph event. Plans had called for Lovell to be joined by his Apollo 8 crewmates Frank Borman and Bill Anders to benefit the Astronaut Scholarship Foundation, but the astronauts each withdrew from the custom signing event. : Historic Space has debuted their second catalog of astronaut autographs and artifacts today with something new: a limited edition presentation of acrylic encased coldplate flown as part of Apollo 11's command module Columbia on the first landing mission. : After turning away offers from the likes of historian Stephen Ambrose and author James Michener, Neil A. Armstrong has granted history professor James Hansen permission to author his biography. Though the book won't hit shelves until mid 2004 (at earliest), Hansen has already gained access to the LIFE archives, a first for an independent researcher. For his part, Armstrong will provide recorded interviews. : Today is the 45th anniversary of the United States' first entry into the space race, the launch of Explorer 1. Only 13 years later to the day, the third crewed lunar landing mission lifted off with the first American in space Alan Shepard as commander, Edgar Mitchell and Stuart Roosa forming the crew of Apollo 14.